Besides being a very gorgeous bird, the Calico Macaw' s parentage lends itself to giving this bird a very gentle and affectionate personality! 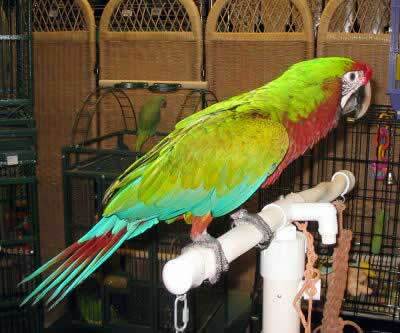 "Hemingway" is a Calico Macaw with the parents being a Green-winged Macaw and a Military Macaw. At only three month old Hemingway is still just a youngster. Hybrid macaws will inherit the personalities of both the parents. In the case of a Calico Macaw like Hemingway, this makes for a very sweet, affectionate, and captivating pet. Hybrid macaws are bred for color. The Calico Macaw is a first generation hybrid macaw, meaning its parents are two species of naturally occurring macaws.The Green-winged Macaw has been has long been a favorite pet bird for both its beauty and its good personality. The Military Macaw is also a favorite with a good temperament, very trainable and highly intelligent. The parentage of the Calico Macaw is a good mix for a pet bird, a hybrid parrot that is very attractive. With the intelligence and temperament of it parents, it should also be quite trainable, learn to talk and do tricks, and have an amiable nature. As with all macaws, they will require good socialization and consistent training to make good pets. Scientific name: The Calico Macaw is a first generation hybrid macaw. It is a cross between a Green-winged Macaw Ara chloroptera and a Military Macaw Ara militaris. Description: Calico Macaws are a very colorful hybrid. Both parents of the Calico Macaw contribute to the striking colors of their offspring, though the father's have the dominant gene and this will influence their final appearance. Most often the father is a Green-winged (male Green-winged macaws are more common than females). Some of the characteristics when sired by a Green-winged macaw will be a large bird, with the head and beak shape more typical of the Green-winged. These macaws have a green back with a bronze cast similar to the Military Macaw, but will have a deep red chest and belly. I just got a calico, its name is calypso. It is such a sweet loving macaw, it loves being with people so much that it hates to return to its cage. He will lay on this back so he can receive belly rubs. I use to have a U-too but this bird is even more affectionate. I also own a catalina that is very sweet and gentle and an excellent talker. I think my favorite though, would have to be the calico. I have a calico and I love him to death, I'm trying to find another one, but can't find a breeder. Let me know please if you know one?? Thanks. Hemingway update! He is now 1 yr & 2 months and just as sweet as ever. He loves to have his head and neck scratched. He has bonded well with both (human) parents.